The society of Lunches for Learning sponsors is known as the Friends of Anabel. A commitment at any of the sponsorship levels listed below qualifies the sponsoring individual, family or organization for membership in the Friends of Anabel. Student sponsorships cover the equivalent of the cost to provide lunches for one student or more for each academic year. Because of efficiencies built-into the L4L lunch distribution process, we are able to feed lunches to each student for an entire 10-month school year at a cost of only $150 (that's only $12.50 per month). Because of their remote, rural locations, many of our L4L-sponsored schools include multi-grade classroom instruction with students in more that one grade level being taught by the same teacher in the same classroom. This is an innovative and collaborative method of instruction which has fascinated many of our sponsors as they've witnessed it first-hand. A Grade Level Sponsor is essentially providing lunches for the equivalent of one grade level (1st graders, for example) while a Classroom Sponsor is effectively providing lunches to the equivalent of an entire classroom, which could include 2nd, 4th and 6th grade, for example, under the instruction of one teacher. In larger schools, classrooms typically include a single grade level in each classroom. School sponsors are individuals, families or organizations with an annual, recurring commitment at one of the sponsorship levels suggested above - allocated to a specific school. School sponsors are recognized with the inclusion of the name of the sponsoring group, individual or organization on a large, permanent banner posted on the front of their sponsored school. School sponsors are encouraged to travel with us to visit their sponsored school, particularly for graduation in November, as a way of developing relationships with the families in the community they support. School Sponsors will be recognized on the Lunches for Learning website and in L4L publications. A school may be fully-sponsored by a single sponsor or sponsorships of any size may be applied toward a larger school, meaning that the school would be co-sponsored by multiple individuals, groups or organizations. The full cost of providing lunches at any given school is based on the enrollment of each school - at $150 per student. Rather than being designated for a specific school, Corporate Sponsorships represent unrestricted operational support. Because the gifts are unrestricted, these corporate partners provide Lunches for Learning with the flexibility to utilize the funds in the area of greatest need at any given point - including both operations and the core lunch program. Corporate partners will receive recognition on the Lunches for Learning website, as well as in L4L publications and at L4L events. Lunches for Learning has always maintained a focus on providing lunches in school - because that's what keeps kids in school and helps them complete their education. However, we have encouraged many of our school sponsors to visit Honduras with us on Vision Trips. These Vision Trips have always been designed to introduce current sponsors to the schools they assist and experience first-hand the very real impact of our mission made possible by their financial support. 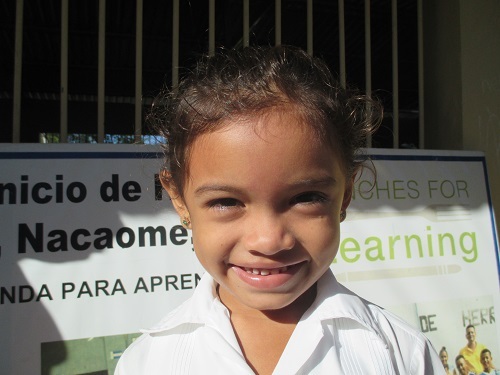 However, because the needs are so many in this poor region of Honduras, our sponsors - and community leaders in Valle - often identify additional needs at their sponsored schools above-and-beyond the lunch program. In 2016 we announced a partnership with an organization called Missions in Action, based in Norcross, Georgia. 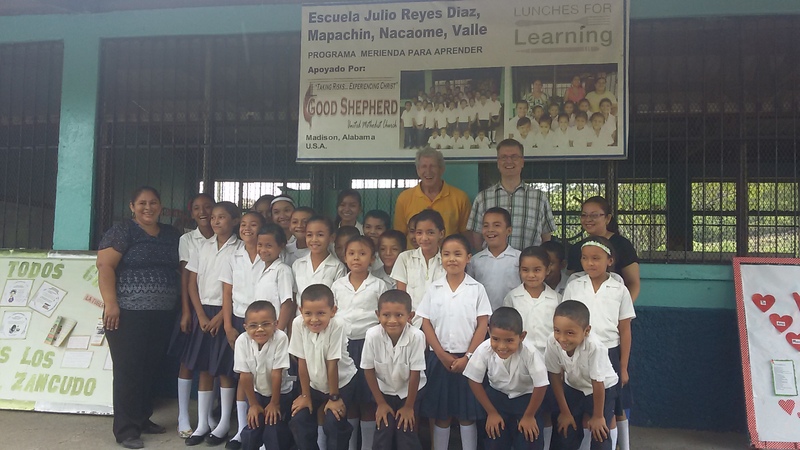 Missions in Action specializes in short-term mission trips designed to improve the educational opportunities for the people of the Valle District - many of the very same communities served by Lunches for Learning. Through our new partnership with Missions in Action, our sponsors and supporters may now take part in week-long mission trips in support of Lunches for Learning schools. These trips - which typically involve building projects - will be planned, coordinated and led by Missions In Action. The benefits of this new partnership with Missions in Action are not limited to L4L sponsors. A representative of any group wishing to serve these rural communities in Honduras through a week-long mission trip is encouraged to contact Phil Dodson. Phil will gladly put you in touch with the folks at Missions in Action to learn more about the planning and implementation of these mission trips. The photo to the right was taken in February 2017 during the celebration of a new classroom building built by Mission in Action mission teams at the school named Ramon Amaya Amador - whose lunch program is sponsored by the Links Group in Montgomery, Alabama. This photo includes Mission in Action team members, Lunches for Learning team members and also members of the school community. The blue-and-white ribbon, used for the ribbon-cutting ceremony, mimicked the Honduran national flag. Ceremony participants were given pieces of the ribbon as mementos of the event. While these needs - classroom buildings, kitchens, etc. - have been addressed by L4L sponsors in the past, our primary commitment remains with the lunch program - meeting a critical need which keeps kids in school. This partnership allows us to maintain that focus on providing lunches while additional needs are met through our work with Missions in Action. 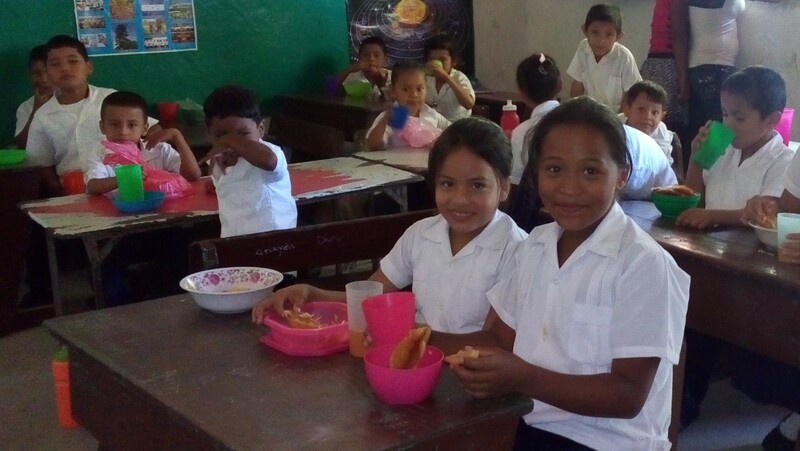 If you would like to learn more about how you as an individual, your family or your church's mission team could complete a mission project in support of a Lunches for Learning school in Honduras, contact Phil to discuss our new partnership with Missions in Action. Attending the February celebration at Ramon Amaya Amador school, the Missions in Action team is pictured in the photo above at left, including Suzanne Crawford Rutledge (center with scissors), Julie Crawford Hill (center, left) and their long-time Honduran team members (in blazers, left to right) Juan Carlos, Henrry and Franklin. One of the Ramon Amaya Amador students peers over her chair at the camera. Joe Murphey, member of East Cobb Rotary in Marietta, Georgia is pictured with one of the school's teachers. Also, Tom Norris, member of The Links Group which sponsors the lunch program at this school, is pictured with Phil Dodson, Lunches for Learning Executive Director. Lunches for Learning, Inc. has partnered with ITAD Technologies to create a program for disposing of decommissioned IT equipment such as desktop computers, laptop computers, flat screen monitors, printers and related equipment. Half of all proceeds from this program will be shared with Lunches for Learning to benefit L4L's core lunch program. 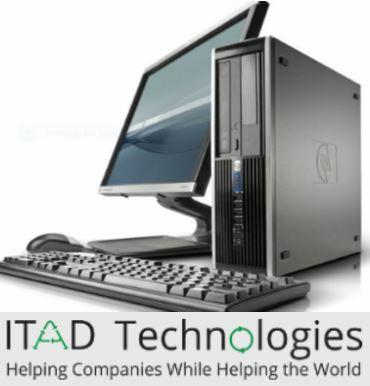 ITAD Technologies, located in Norcross, Georgia, is an IT Asset Disposal/Electronic Recycler focused on the enterprise (business) client. This opportunity is currently available for businesses located in the metro Atlanta area. If your company has a closet, storage room or cubicles full of decommissioned or unused IT equipment, and you are looking for a secure and environmentally-friendly way to get rid of these items, this could be the ideal solution. ITAD Technologies will not only take these useless items off your hands, but will also recondition all components which are able to be re-sold and 50% of the proceeds from all sales go directly to Lunches for Learning. Even the older components that are too outdated to be reconditioned can be scrapped, which also adds to the proceeds ITAD Technologies will share with Lunches for Learning. For equipment collected through this new partnership, ITAD Technologies will refurbish all components eligible for re-sale and a full 50% of the proceeds of all sales will go to Lunches for Learning. Funds received by Lunches for Learning through this partnership will benefit our core lunch program. When you call or email, be sure to reference "Lunches for Learning" in your communication. ITAD Technologies will work with your company to arrange a convenient time to pick-up your unused equipment. You can also visit the ITAD Technologies website to submit an online E-Cycling Request. Be sure to reference "Lunches for Learning" on the online request form as well.